The Security Council, reaffirming its commitment to contribute to the consolidation of peace and stability in the Democratic Republic of the Congo's post-transition period, today authorized the United Nations Mission there to assist the Congolese authorities in organizing, preparing and conducting local elections. Unanimously adopting resolution 1797 (2008), tabled by France, the Council based that decision on the Secretary-General's recommendations, conveyed to the Council in letters dated 11 October and 30 November 2007 (document S/2007/694), and in his report on the United Nations Organization Mission in the Democratic Republic of the Congo (MONUC) of 14 November 2007 (document S/2007/671). In response to requests by Council members for information regarding the cost of MONUC's support for the elections -- anticipated in the latter half of the year -- the letter, dated 30 November, attaches preliminary estimates. In its last action concerning MONUC, on 21 December 2007, the Council extended its mandate through 31 December 2008 by adopting resolution 1794 (2007). Also during today's meeting, Council President Giadalla Ettalhi (Libya) read out a statement congratulating President Joseph Kabila and the Government of the Democratic Republic of the Congo, as well as the organizers of and participants in the Conference for Peace, Security and Development in North and South Kivu, on the success of that event, held in Goma from 6 to 23 January. The Council was particularly pleased that the armed groups in North and South Kivu had undertaken to observe a complete and immediate ceasefire, to begin the withdrawal of their forces, and to abide strictly by the rules of international humanitarian and human rights law, as set out in statements of commitment signed by the Government on 23 January. In the framework of the fight against impunity, the Council, while noting the Government's pledge to seek parliamentary approval of an amnesty law covering acts of war and insurrection, welcomed the exclusion of genocide, war crimes and crimes against humanity from the scope of that amnesty. Encouraging MONUC to support the implementation of the statements of commitment, the Council welcomed the resolutions adopted at the Goma Conference and underscored the need for the Congolese authorities to seek long-term and comprehensive ways to address the root causes of instability. It reiterated the importance of commitments undertaken with the Government of Rwanda, in a joint communiqué signed in Nairobi on 9 November 2007, to end the threat posed to peace and stability in both countries and the Great Lakes region by illegal armed groups in the eastern part of the Democratic Republic of the Congo. It called on both Governments to fully implement the Nairobi communiqué. The meeting began at 5:45 p.m. and adjourned at 5:59 p.m.
"2. Decides to remain actively seized of the matter." "The Security Council congratulates President Kabila and the Government of the Democratic Republic of the Congo, as well as the organizers and participants in the Conference for Peace, Security and Development in North and South Kivu, on the success of the Conference, held in Goma from 6 to 23 January 2008. "The Security Council is particularly pleased that the armed groups in North and South Kivu have undertaken to observe a complete and immediate ceasefire, to begin the withdrawal of their forces with a view to their brassage or their disarmament, demobilization and reintegration under the national programme for that process, and to abide strictly by the rules of international humanitarian and human rights law, set out in the statements of commitment (Actes d'engagement) which they signed with the Government of the Democratic Republic of the Congo on 23 January 2008. "The Council commends the Government for ordering a ceasefire in accordance with the statements of commitment. In the framework of the fight against impunity, while noting the Government's pledge to seek parliamentary approval of an amnesty law covering acts of war and insurrection, the Council welcomes the exclusion of genocide, war crimes or crimes against humanity from the scope of this amnesty. "The Security Council urges all the parties to the agreements to respect the ceasefire and to implement the other commitments they have undertaken effectively and in good faith. In this connection, it emphasizes the importance of the work to be carried out by the joint commissions provided for in the statements of commitment, and encourages the international community, including the United Nations Organization Mission in the Democratic Republic of the Congo (MONUC), to support that process. It also encourages MONUC to support the implementation of the statements of commitment, within the limits of its capacity and in accordance with its mandate, including with regard to the protection of civilians. "The Security Council also welcomes the resolutions adopted at the Conference and calls upon the appropriate authorities to act on the recommendations addressed to them. It underscores the need for the Congolese authorities and all political and social stakeholders in North and South Kivu to continue, through dialogue, to seek long-term and comprehensive ways to address the root causes of instability. 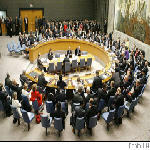 "The Security Council reiterates the importance of the commitments undertaken by the Government of the Democratic Republic of the Congo and the Government of the Republic of Rwanda in their joint communiqué on a common approach to end the threat posed by illegal armed groups in the eastern part of the Democratic Republic of the Congo to peace and stability in both countries and the Great Lakes region, signed in Nairobi on 9 November 2007 (S/2007/679). It calls on the two Governments to continue to implement fully the joint communiqué, in particular by promptly taking appropriate measures to induce the Forces démocratiques de libération du Rwanda (FDLR) and other foreign armed groups to lay down their arms without preconditions and return to their home countries. "The Security Council encourages the international community, in particular the eastern neighbours of the Democratic Republic of the Congo in the Great Lakes region, to fully support the new dynamic launched by the Goma Conference and the Nairobi communiqué, which together represent a major step towards the restoration of lasting peace and stability in the Great Lakes region." The Security Council had before it the twenty-fourth report of the Secretary-General on the United Nations Organization Mission in the Democratic Republic of the Congo (MONUC), in which he recommends the extension of its mandate for a year, until 31 December 2008. The report (document S/2007/671), covering the major political and security developments in the Democratic Republic of the Congo from 20 March to 31 October and providing broad benchmarks and recommendations regarding the future direction of MONUC, notes that the Government has demonstrated a strong determination to exert its sovereign responsibilities throughout the country, taken the first steps towards security sector reform, and made a firm commitment to decentralization and the early holding of local elections. Notwithstanding these positive developments, prospects for the future continue to be overshadowed by long-standing security challenges in the eastern part of the country, the Secretary-General states, recommending that MONUC retain its current complement of military, police and civilian personnel at least until the end of the local elections. Gradual drawdown may then commence, subject to progress towards broad benchmarks, including successful completion of the local elections, and, most importantly, ensuring the security of the population. A technical assessment team visited the country to consult with Congolese and international interlocutors, as well as the United Nations country team in order to recommend benchmarks and a timeline for the Mission's gradual withdrawal. The consultations revealed a consensus that any plan for downsizing MONUC and eventually withdrawing it should be based on several key preconditions: that Congolese and foreign armed groups will be disarmed and demobilized or repatriated; that the Congolese Armed Forces (FARDC) and Congolese National Police will be able to assume responsibility for the country's security; and that MONUC will remain deployed at its current strength at least through local elections. Benchmarks were identified for measuring the country's progress towards two overarching objectives reflecting the central priorities set out in resolution 1756 (2007), namely the establishment of a stable overall security environment and the consolidation of democratic institutions. According to the report, the latter goal will be measured by the achievement of broad benchmarks such as: stabilization of sensitive areas, particularly in the east; completion of the disarmament and demobilization of former combatants and repatriation of foreign armed groups; extension of State authority throughout the territory; and security sector reform. The report notes that the crisis in the Kivu provinces has many dimensions which call for a comprehensive solution, including an end to the fighting, the disarmament and demobilization or integration into the Armed Forces of militias and the re-establishment of State authority and the rule of law. Steps are also urgently needed to resolve the problems presented by all foreign armed groups on Congolese soil, particularly the Forces démocratiques de libération du Rwanda (FDLR). In order to address the problem of foreign armed groups, a common approach and close cooperation will be needed between the Democratic Republic of the Congo and other States in the region, supported by the international community.